There are 45 days left in the PGCBL regular season, which ends on July 30. Elmira 7 Utica 5: The Elmira Pioneers scored lone runs in three of the late innings to go on and defeat the Utica Brewers, 7-5, at Murnane Field. The Pioneers got out to an early 2-0 lead in the top of the second on a Dalton Hoiles two-RBI single. A Dan Vucovich two-RBI single in the home half of the inning tied the game at two. 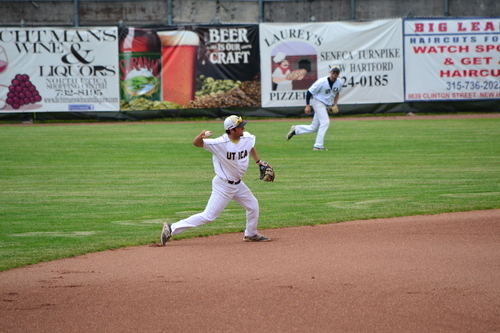 Tommy Mirabelli hit a two-RBI double in the top of the third to give Elmira the lead back, but the Brewers scored three runs in the fifth to take the lead. Taylor Olmstead hit an RBI triple, Kyle Schade hit an RBI single and an RBI groundout accounted for the three runs. A Will LaRue RBI groundout in the top of the sixth tied the game. The Pioneers took the lead for good in the top of the seventh on a Josh Lovelady RBI single and added an insurance run in the ninth on an error. Mike Korchak picked p the win for Elmira with Ryan Bellomo notching the save, while Jake Amoroso took the loss. Mohawk Valley 10 Albany 0: The Mohawk Valley DiamondDawgs used a stellar start from Payton Coddou to shut-out the Albany Dutchmen, 10-0, in Little Falls. Coddou moved to 1-1 on the year by tossing seven scoreless innings, allowing just two hits and striking out four Dutchmen. A Thomas Walraven RBI triple and a sacrifice fly gave the DiamondDawgs an early 2-0 lead in the first. No more runs were scored until the bottom of the seventh when Anthony Herrera hit a two-RBI double and Matt Pagano hit an RBI single to make it a 5-0 game. The DiamondDawgs scored five more runs in the bottom of the eighth to extend their lead. Anthony Capo and Anthony Herrera both hit RBI singles, a bases-loaded walk scored a run and Walraven hit a two-run single. Jon Reid allowed five runs in 6.2 innings in taking the loss for Albany. Glens Falls 9 Saugerties 0: The Glens Falls Dragons also used a strong pitching performance to lead them to a shutout, beating Saugerties, 9-0. Sam Steeves tossed seven scoreless innings to earn the win, allowing five hits while striking out eight Stallions. Jared Tobey allowed four runs (two earned) in five innings in taking the loss for Saugerties. Adirondack at Newark: The game was postponed and will be made up in a doubleheader on June 28. Amsterdam at Victor: The game was postponed and will be made up in a doubleheader on July 14. Utica at Albany 7:05 p.m.: The Utica Brewers travel to the Capital City to take on the Albany Dutchmen in the only PGCBL game of the day.